The chestnut racehorse “Eclipse” by the rubbing-down house at Newmarket with groom and stable-lad. Francis Sartorius was born in or about 1734 (he was recorded as aged 70 at his death in 1804), but the details of place, precise date and his parentage are unknown. There is a tradition that he was the son of one John Sartorius, said to be a sporting painter and a descendant of the artistic Sartorius family of Nuremburg. No documentary evidence survives to confirm or deny this. Judging from an autograph inscription on the back of a horse portrait formerly with Arthur Ackermann & Son, he worked initially for Thomas Butler, a dealer and artist, in Pall Mall, London. Francis Sartorius was based for the whole of his life in London, where he maintained studios and lodgings at various addresses in Soho (he was living with his son J N Sartorius in Spur Street, Leicester Square, at the date this picture was painted in 1776). However, his paintings are far from urban: his entire output is devoted to recording sporting and equestrian themes in all their diversity. Inevitably, given that his patrons were mainly Country Gentleman, he was itinerant, and seems to have painted in many of the counties of England, as well as being one of the first purely sporting painters to work in Ireland. He exhibited frequently at the main London venues, such as the Free Society of Artists and the Royal Academy. He was extremely prolific and has left us with an invaluable record of all the country sports during their Golden Age. His style is old-fashioned, and slightly wooden, but his works have about them a timeless and evocative air of charm. He died intestate in 1804, when administration of his estate was granted to his only surviving son of his two marriages. His estate was valued at just £100: his great productivity seems not to have compensated for his inability to charge high prices (Sartorius was receiving 15guineas for a large canvas when middle-rank portrait artists like William Beechey were receiving 100guineas for a similar sized human portrait). Eclipse (1 April 1764 – 26 February 1789) was an outstanding, undefeated 18th-century British thoroughbred racehorse who won 18 races, including 11 King's Plates. After retiring from racing he became a very successful sire. Eclipse was foaled during and named after the solar eclipse of 1 April 1764, at the Cranbourne Lodge Stud of his breeder, Prince William Augustus, Duke of Cumberland It was at this stud that his sire, the Jockey Club Plate winner, Marske (by Squirt from The Ruby Mare) stood. His dam, Spiletta (foaled 1749) was by Regulus, by the Godolphin Arabian. Eclipse was a brother to the successful broodmare, Proserpine. After the death of Prince William in 1765, Eclipse was sold for 75 guineas to a sheep dealer from Smithfield, William Wildman. Eclipse started racing at the age of five on 3 May 1769 in Epsom. Eclipse, who had just galloped to an easy victory in the first heat of the Noblemen and Gentlemen's Plate, was enjoying a rub down, (and perhaps a tot of whisky), in preparation for heat two. It was common knowledge that Eclipse would win the second heat at a canter, and the Irish adventurer Captain Denis O'Kelly could find no-one to lay him odds for this second victory. So he used the famous phrase "Eclipse first and the rest nowhere," before making his bets for this race. At that time, a horse that was more than 240 yards behind the lead was said to be “nowhere”. His jockey was John Oakley, supposedly the only jockey who could handle Eclipse's temperamental manner and running style of holding his nose very close to the ground. Eclipse won the race easily, and O'Kelly won his bets. 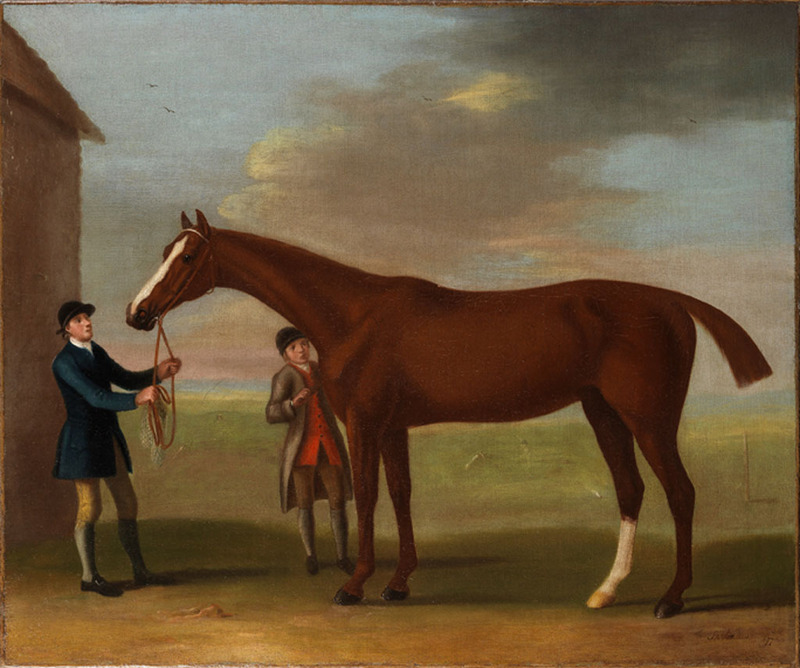 After his second victory Colonel Dennis O'Kelly purchased Eclipse in two parts (50 percent in June 1769 for 650 guineas, 50 percent in April 1770 for 1,100 guineas). Eclipse won 18 races, including 11 King's Plates, supposedly without ever being fully extended and proving far superior to all competition. During this time he raced over 63 miles and walked 1,400 miles to race meetings across England.